New Falcons stadium: $2 hot dogs, $5 beers, expensive seats. How do Vikings compare? Atlanta stadium slated to open in 2017 generated some positive press with the announcement of reasonable prices for many food and drink items. But it's worthwhile to take a closer look at what's being offered. Compare that to NFL stadium averages: $4.70 for a soft drink, $5.40 for a hot dog and $7.50 for a beer. One of each of those at an average NFL game would cost almost $18. At a Falcons game, it would be $9 — half that price. 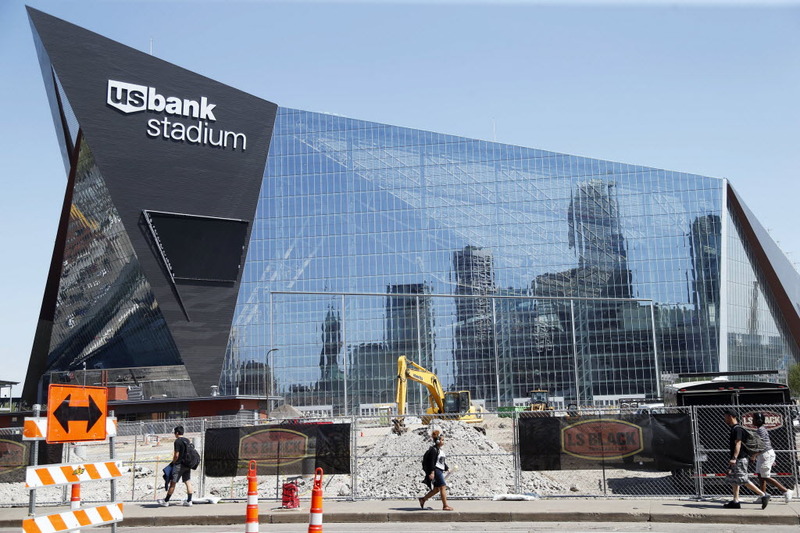 It made me curious what the price points will be at U.S. Bank Stadium — and whether the Vikings are considering any similar deals. With that stadium set to open in a couple months while Atlanta’s is a year away, I was a little surprised to find out that prices haven’t been set yet. That was confirmed by both the Vikings and Michele Kelm-Helgen, the chair of the Minnesota Sports Facilities Commission. “Our prices are still being finalized, but they’ll be competitive with other venues in the region,” Kelm-Helgen said in response to my query. “Our goal is to create a world-class dining program that enhances the overall stadium experience; this takes into account several factors such as menu variety, food quality and customer service.” Fair enough, and it’s worth noting Atlanta will surely have plenty of higher-end, more expensive specialty items in line with the options unveiled by the Vikings this week (also without prices). But it’s also worth noting that if the Vikings’ prices are “competitive with other venues in the region” they will not be cheap. Let’s focus on beer for a moment: If we’re talking other NFL teams, a small beer at a Bears game is $9.25 and at a Packers game is $7.75. If we’re talking other major sports teams in the Twin Cities, a small beer at Target Field for a Twins game is $7.50; a 20-ounce beer at a Wild game in 2014-15 was $9.50 – same as it was at a Wolves game last year, according to Statista.com. So Falcons fans will come out ahead there, and the team gets some nice press as a result. The flip side is that while a Falcons fan will presumably save on a hot dog and a beer compared to a Vikings fan, Atlanta is also harvesting a lot more front-end money from seat licenses — the one-time fee you pay before you can buy your season tickets — than your local NFL franchise. As of November, the Falcons had brought in $140 million from PSLs, with more yet to sell. Their most expensive license is $45,000. The Vikings, in contrast, were slated to get $100 million total from that source — with $9,500 being the highest-priced license. It’s all a matter of choosing which pocket from which you’d rather have the money taken.